Forget the French patisseries and Japanese bakeries. Sprüngli (pronounce it like spru-li), a confiserie in Switzerland sells the BEST macaroons ever. These mini macaroons are airy and not as dense as most macaroons I've eaten. They are also surprisingly not as sweet, which the main problem (for me) for most macaroons. I'm not sure why they don't taste as sweet, but I think it's probably due to the way the filling in the middle is balances the sweetness of the shell. For example, the chocolate macaroon has a slightly more bitter filling and the raspberry one a slightly more sour filling. Together with the airy shell, they taste just perfect. They call these mini macaroons Luxemburgerli. They come in great variety of flavours ranging from chocolate, pistachio, raspberry to Bourbon vanilla and Champagne Gold. They also seem to have weekly specials. I had a rhubarb one which I thought was pretty good. Another one I tasted was extremely delightful - it was a raspberry and chocolate mini macaroon with a very tart raspberry jam in the middle. I'm salivating now at the thought of the macaroons and wish they would set up a store here in Singapore. 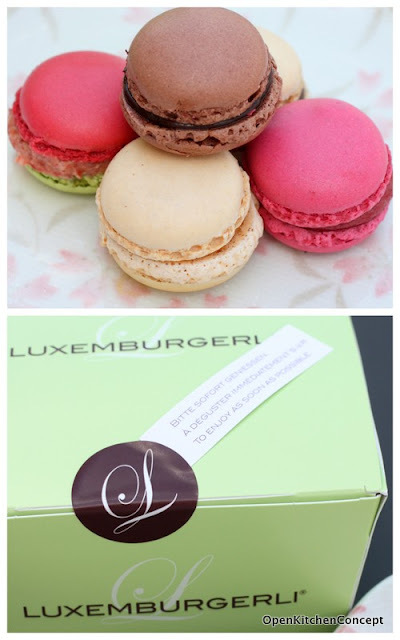 Apart from these irresistibly macaroons, Sprüngli also sells amazing Swiss chocolates. Their Truffles Du Jour are very good - they are made from chocolate ganache (chocolate, fresh cream and butter) every day and sold within 24 hours of production. Yum. They also sell a wide variety of pastries and I ended up gaping at all the different products in each store I went into.. so much so I did not take a single photo of any of the stores. I only remembered to take a picture of the front of the counter at the airport. Once I ventured near, I forgot all about photos..
Notes: A bit of background on the word Luxemburgerli I've found over the internet. Luxemburgerli is a registered trademark by Sprüngli. Similar to the French macaroon, the Luxemburgerli is smaller in size and is lighter and more airy in consistency. It was invented in 1957 by confectioner Camille Studer. The term "Luxemburgerli" was derived from her nickname a colleague gave her based on her country of origin.